“We are made of star-stuff,” wrote Carl Sagan, famed astronomer and science communicator, in his 1973 book The Cosmic Connection. Paleoecologist Curt Stager expands on the poetic concept in his latest book, Your Atomic Self, in which he tracks the cyclical journey of the basic building blocks of matter through the cosmos, into the Earth, and into our bodies. Stager sprinkles numerous philosophical gems throughout the book as he follows the elemental constituents of the human body on their trek through time and space: “The birth of your blood iron destroyed the stars that created it. Between their visits to Leonardo and to you, some of the same nonjudgmental atoms of the air also toured the lungs of Adolf Hitler,” and “When you flush your wastes, you scatter the atomic echoes of lightning bolts and volcanoes into a global cycle that may some day return them to you, as unpleasant as that may sound.” Not simply a jumble of cocktail-party facts about the amazing connections between ourselves, our world, and everything else we can observe or measure, Your Atomic Self also tells the tale of the researchers who helped bring such mind-expanding concepts to light. It has become a mantra of the science-advocacy community that researchers must do a better job of communicating their work to the public. 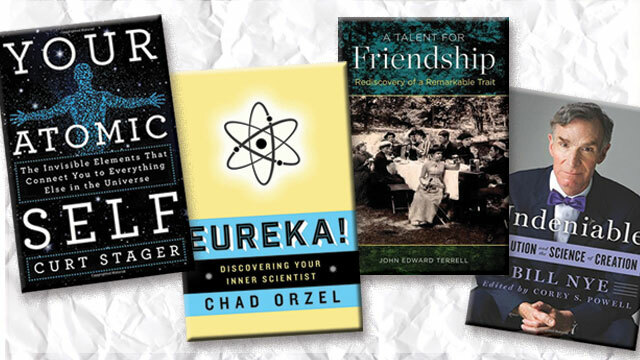 In his latest book, Eureka, Union College physicist Chad Orzel flips the perspective to remind us that the public already has a relationship with science, even if laypeople aren’t aware that they’re employing the scientific method every day. From collecting stamps to playing Angry Birds on a tablet, the author argues, we all think like scientists when doing even the most mundane things. Between the lines, Orzel fulfills the modern mandate of science advocacy by making science and its practitioners accessible to the average reader, but his tack of connecting with his readers on more common ground first is a refreshing twist to the approach. Move over, speech, bipedal ambulation, and complex abstract reasoning. There’s a new, evolved characteristic that makes humans unique in Kingdom Animalia: the ability to make friends. Such is the premise of A Talent for Friendship, the new book from anthropologist John Edward Terrell, who is the longtime curator of Oceanic archaeology and ethnology at Chicago’s Field Museum. The Science Guy can write. Sparked by what some in the scientific community decried as an ill-advised evolution vs. creationism debate with Ken Ham, president of the “apologetics ministry” Answers in Genesis, Bill Nye devotes an entire book to explaining the nuts and bolts of evolution to a lay audience. In Undeniable Nye acquits himself nicely, with accessible, but not too dumbed-down, prose and an engaging tone. Nye refuses to pull punches, but at the same time offers characteristic olive branches to the creationist camp, repeating his constant refrain that scientific thinking is the best way to improve our fate as a civilization. This, he writes, starts with embracing the tenets of evolution. Nye covers familiar ground here: the rise of antibiotic resistance, the evolution of varying skin colors, etc. Bringing his unique and popular (he has almost 3.5 million “likes” on Facebook!) voice to the fray, Nye is able to communicate the basics of evolution to a new, younger audience who, now more than ever, need to be exposed to such clear thinking.